Time Released Intense Blend Protein by M4 Nutrition! Amazing taste, amazing blend, amazing protein. 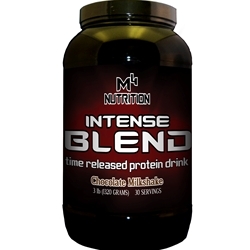 Intense Blend is a blended protein that contains, Whey, Egg, and Casein. If you like BSN Syntha 6, you will LOVE Intense Blends and you will love the savings. 24 grams of protein, 5 grams of fiber, 6 grams of BCAAs, and digestive enzymes! M4 Nutrition Intense Blend combines 7 different proteins to fuel your body for a full four hours. Proteins are digested at different rates. By combining different proteins you enjoy an immediate, medium and extended source of nutrition as your body breaks protein down into amino acids. Immediate Release – Whey Protein Isolate and Whey Concentrate are absorbed within 30 minutes after you consume them. Medium Release – Egg Protein and Milk Protein Isolate fuels your body with amino acids for 1½ hours (90 minutes). Egg is considered a perfect protein because it has the highest protein efficiency ratio. Extended Release – Micellar Casein and Calcium Caseinate take much longer to digest. You get a full 4 hour release of amino acids. This makes these proteins ideal for appetite control. Ideal Ratio of Protein, Complex Carbs and Healthy Oils. M4 Intense Blend includes an ideal ratio of complex carbohydrates and healthy oils to support extended time-release of amino acids. Protein Blend (Whey Protein Concentrate [Milk], Whey Protein Isolate [Milk], Milk Protein Isolate [Milk], Calcium Caseinate [Milk], Micellar Casein [Milk], Egg Whites [Egg], And Glutamine Peptides [Wheat]), Sunflower Powder Consisting Of (Sunflower Oil, Maltodextrin, Sodium Caseinate, Mono & Diglycerides, Di-Potassium Phosphate, Soy Lecithin, Sodium Silicoaluminate, And Tocopherols), Litesse Polydextrose, Natural And Artificial Flavors, MCT Powder Consisting Of (Medium Chain Triglycerides, Nonfat Dry Milk, Di-Sodium Phosphate, And Silicon Dioxide), Cellulose Gum, Sodium Chloride, Sucralose, Acesulfame Potassium, Papain, Aminogen, And Lecithin [Soy]. Warning: Manufactured On Equipment Which Processes Products Containing Milk, Eggs, Soybeans, Wheat, Shellfish, Fish Oil, Tree Nuts, And Peanut Flavor. Directions - Mix 2 rounded scoops (44g) with 4-6oz of milk, water or your favorite beverage. Vary the amount of liquid for taste preference.